I am now home from sunny Africa where I taught women how to massage in a village near Meru, as part of a project run by IPI, International Peace Initiatives. I am feeling the cold to be a bit of a challenge and hoped that the snow would be all gone. I have just come in from a walk and my hands are so cold I can hardly type. I thought that I would work with the women that are part of the BOLD project, that make jewelry and help run a business that provides a salary for them and an income for IPI. What happened is that I was asked to work with a group of women in the community that surrounds KATCH, which is the children’s home (that is at the centre of everything that IPI does and is the main reason IPI came about, this is my opinion from what I experienced in Kenya). The women are part of INPEACE (Institute for Nonviolence and Peace) which is one of the Institutes that IPI supports and helps fund. The role of these particular women is that they help keep the peace and prevent violent behaviour in the local community, a bit like ‘neighbor hood watch‘ in the UK. However, continuing with the ethos of IPI these women are educated and empowered in how to create and sustain peace, how to be healthy and how to sustain their own incomes and stay out of poverty. 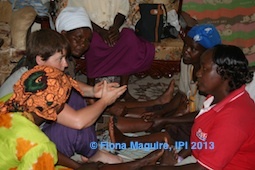 Fiona Maguire teaching a massage course for women that are supported by IPI, International Peace Initiatives. The women were all very positive, curious and eager to learn; which is often qualities we in the West associate with children rather than adults. The women knew that they have the power to change their lives through education, knowledge and applying what they learn. For some of these women they did not have the chance to learn anything new until they got support from IPI. Dr Karambu, the founder and head of IPI, was not sure what the women would think about the energy work. However, they were curious when Dr Karambu introduced it. When I done my grounding exercise with them, they all felt the energy of the ground and were very excited about it. This is what happened with every energy exercise, they just got it straight away and could sense the benefits of it. I think this is because all the women are use to working intuitively with the natural cycles of the environment and the plants, form growing food for their families. The women were all intelligent and what I admired most about them was that they were willing to experience first and question / analyze later; I have a tendency to do this myself unless it is something I get triggered by like money or rudeness. Having an open mind and wiliness to try something new, I think is a lesson that we can all learn from. Me, Betty, Newton and “one of the gang”. As I have said before the children and the ethos of education, enterprise / self-sustainability and empowerment are central to IPI. The children either had no parents or had a parent who just was not able to provide for them or did not act like a parent towards their child. All the children took great pride in themselves and seemed very happy and well rounded individuals. A few of the children form a bond with me on the first day that I met them, particularly Stacy, Betty and Newton. Due to the children being at school and having a very packed school week I did not feel that they had enough spare time for me to do ‘work’ with them. I did play with the children every day that I was in Kenya and I feel that we all enjoyed this very much. The children at IPI were very dedicated to their school work. During the school week they would have to wake up between 5.30 and 6.30am, to be able to walk to school in time, which for some was an hours walk. They would have an hour of compulsory sports in school at the end of lessons every day and then they would walk home. When they got back to the children’s home they would take of their school uniform and wash their socks and underwear by hand. The older kids would then do home work and the younger kids would do chores. Then they would have some time to play before dinner. After dinner they would have 1 1/2 hours of tutoring and finally go to bed at 9.30pm. None of the children complained about this long day. In fact all of them understood that education gave them HOPE and a way to stay out of poverty. All the children could read and write in English and I thought had better literacy levels than the children in the UK, even through their first language was the local dialect and this is what they communicated in amongst themselves and to other adults. 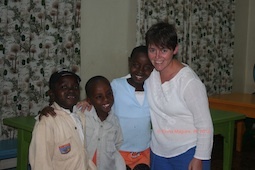 Furthermore the children seemed to be able to understand and speak Swahili. The children are educated in English. If you would like to Donate to IPI visit their website. Any amount of donation is very much appreciated. I have set up a bank account and a Paypal account that is only for collecting money for this purpose. Making everything transparent and I am happy to share the details with people who make donations, and of course everything is confidential. When you make a donation as a way of saying thank you, you will be diverted to a page where you will get to choose a free gift, which people would normally buy or receive when they are doing coaching or training with me in my business Real Energy, Empower Yourself www.RealEnergy4All.com If people donate over 50 I will send them a copy of my book “The Key to Awareness” as a special thank you.